Part 12 of 13, excerpted from an essay entitled “Disturbo 13: The Most Disturbing Horror Films Ever Made” by Stanley Wiater. Combat Shock is the tragic story of a wasted Vietnam veteran, living in abject poverty in the Bronx with his wife and baby. Every day is a battle to stay alive; every night is a battle to retain what’s left of his steadily eroding sanity. If this weren’t bad enough, the couple’s baby is not quite human (can you say Eraserhead? ), having been genetically damaged by the aftereffects of Agent Orange brought home by Dad as an added legacy of lifelong despair. The film is so painful because the filmmakers make absolutely no pretense to soothe us with even a moment of happiness for anyone in the story. Every pitiful character is shown to be hopeless, knowing only drugs and violence and suffering. Incredibly, the man’s situation gets even worse—finally concluding with an extended murder-suicide bloodbath after putting the baby into the oven and turning it on high. Nearly unbearable in its raw intensity, Combat Shock makes the violence and nihilism of Taxi Driver seem like a Walt Disney production. Due in large part to the fact that absolutely nothing came out last week, I’m left with a startlingly small amount of material to review. It was with some trepidation, then, that I ventured into a showing of Emperor, having nary a clue what I was in for. It’s been a good, long while since we’ve had a honest war move come down the pipe, let alone a historical piece. 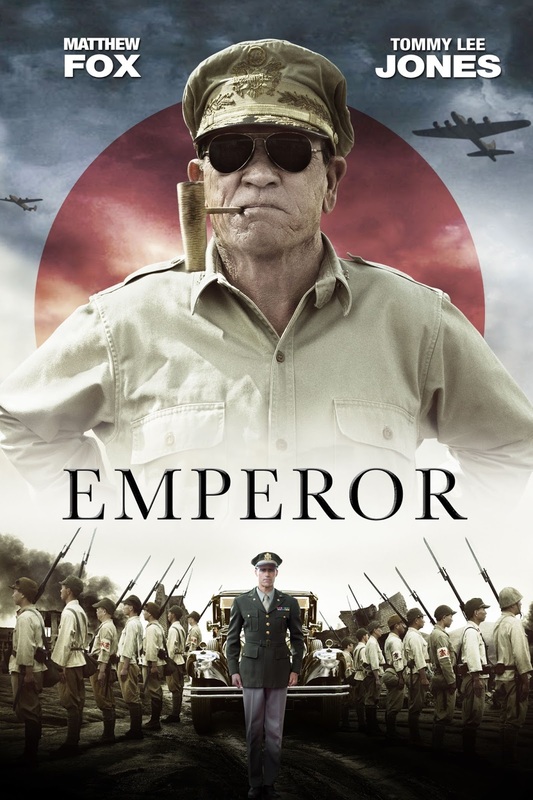 Emperor takes a fresh look at WWII through the veil of historical fiction, as the story of the American occupation of Japan and the the ultimate fate of Emperor Hirohito unfolds. I’m happy to say that my reluctance was unfounded, as Emperor proved to be a generally engaging and satisfying experience. Based on the novel His Majesty’s Salvation by Shiro Okamoto, Emperor is directed by Peter Webber. Like his other work including cult hit Hannibal Rising and Girl With the Pearl Earring, Webber takes on this piece of historical fiction with enthusiasm. Direction is solid and functional but unremarkable, and is therefore uninteresting to talk about. In virtually the same role he’s been type cast for since the 1970’s Tommy Lee Jones brings General Douglass MacArthur to life as he becomes the de facto ruler of Japan after its surrender in World War II. As is to be expected of Jones’ performances, the character is here represented with a fundamental essence of humanity and brings across in his performance the immense pressure and responsibility that has been placed upon MacArthur’s shoulders. Matthew Fox lends his talents to the role of Bonner Fellers, the world’s most generically American man. While for the most part perfectly functional, Fox’s performance comes across as slightly stilled, though I could be misinterpreting his military precision for a lack of personality. It’s strange really. Here we have a character with an inner conflict, a motivation, a seemingly insurmountable problem, and yet, unfortunately, Bonner Fellers seems to behave like some kind of hyperrealistic robot, programed to simulate frustration, anger, and sadness at the appropriate times. His performance is difficult to critique because it’s too good to be called bad and too mediocre to be called exceptional. What we end up with, however, is essentially a bland mess. The films switches periodically from the investigation of the Emperor’s involvement in Japanese military endeavors of WWII to the story of a pre-war Fellers and his Japanese love interest. Interestingly and refreshingly, this juxtaposition is actually plot critical, as the lessons Fellers learns about Japanese society and culture while fraternizing with his woman and her family prove to be key insights into the psyches of the Japanese people and their loyalty to the emperor. While providing a context for Feller’s later conclusions about the emperor, the film simultaneously uses those flashback sequences as a means to flesh out his character and portray him in a sympathetic light as he and his blushing bride to-be build a meaningful relationship. As I mentioned a moment ago, however, Fox’s disingenuousness puts a damper on an otherwise surprisingly effective plot device. Additionally, I enjoyed the fact that General MacArthur’s motivations remained ambiguous until the end and mirrored the overall atmosphere of uncertainty and intrigue in terms of both the investigation of the emperor and the general atmosphere of now leaderless Japan as a whole. That tension is what held an otherwise slightly boring movie together and kept me engaged until the end. Ultimately, I think that film suffered from a relatively slow pace coupled with the fact that not an whole lot actually ends up happening to begin with. As high as the stakes seem to be, all we can do is to take General MacArthur’s word for it. By that, I mean that the audience is told that if the Emperor is arrested, the occupying force might risk a mass uprising, but not necessarily shown that a threat is posed by such a gambit. The success of a film (a primarily visual medium, remember) relies on the fact that the director is able to show us, and not simply tell us, that the stakes are being raised. As it stands, what we’re shown is a scattered and desolate citizenry that is on the verge of starvation and wouldn’t last two seconds in an insurrection against the US army. This, in a very real sense, eliminates a lot of the urgency and danger that would have been present in the film otherwise. Though Emperor has it’s flaws, primarily with Fox’s stilled acting and the seemingly hypothetical stakes, it also does a lot of things right. Jones portrays a believable and engaging MacArthur and the originality and freshness of the plot bring a lot to the table as well. Overall, Emperor is a very decent experience and may be an especially welcome respite for the history buffs among us.